Truro Golf Club Head Greenkeeper, Jim Sheehan, is a long way from his Liverpool roots and West Derby Golf Club where he first encountered the Sisis name. In August of this year he took delivery of a Sisis Variseeder 1300 with standard discharge roller and also a Multitiner 1.8m aerator and immediately put them to work. Jim says "I had positive memories of the Sisis brand from my early years in green keeping and was keen to use the Variseeder as an integral part of a new programme of over seeding we have implemented to address particular issues we have with our greens. They have been predominantly Poa Annua, and as they are on the small side, they do suffer from excessive wear and tear. The work level required to maintain the greens to a satisfactory standard has been extremely high. "Prior to bringing in the Variseeder we had been seeding by hand, but since August we have been scarifying and over seeding with pure Bents. We have over seeded the majority of greens twice in a six week time frame and four greens which had particular problems, fortnightly, also over a six week period. We work in both directions and with the Variseeder’s adjustable seeding rate, have applied up to 2.5kg of seed on greens. "Importantly, the application process where the studded roller creates the seed bed, means we do not have to take greens out of play. The grass growth and coverage achieved has far exceeded expectation and we are keen to maintain at this new level. 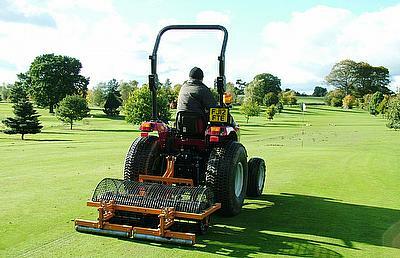 "The 1.8m Multitiner, drum type tractor mounted aerator, was brought in to strengthen our machinery fleet and its use to date has already produced positive results. It will really come into its own next season when we will be working it fortnightly on a wide range of areas on the course. 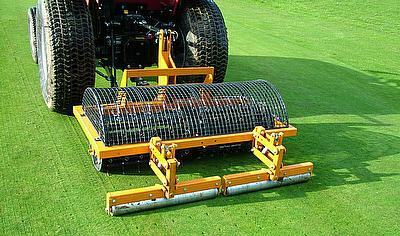 It is fast and effective and importantly, leaves minimal surface disturbance. "The positive effect on our greens and course, in the short time-span since we added Sisis to the team, has been superb and I feel we now have both the right course maintenance programme in place and the right kit to deliver it."